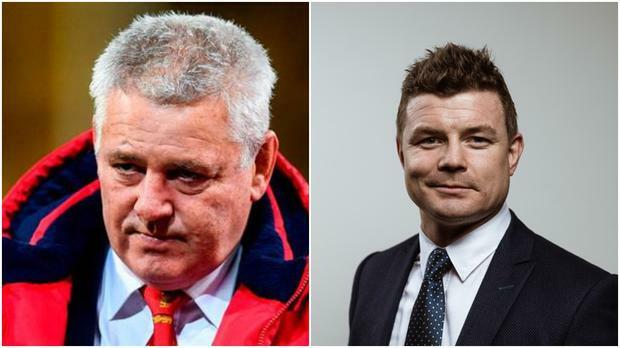 Former British and Irish Lions captain Brian O'Driscoll has said that Lions coach Warren Gatland's selection of the 'geography six' - the six players called up as injury cover for the Lions midweek games - was a big mistake. Two weeks ago Gatland had called up Wales internationals Cory Hill, Kristian Dacey, Gareth Davies and Tomas Francis, as well as Scottish duo Allan Dell and Finn Russell, the day before the Lions' 32-10 demolition of the Māori All Blacks in Rotorua. The mid-tour additions were met with widespread condemnation from former players and pundits alike, with many assuming the position that the Lions jersey had been 'devalued' as a result of their arrival. O'Driscoll, who captained the Lions on their last tour of New Zealand in 2005, said that it was a 'disservice' to the players involved for them to be selected, with only Russell and Dell seeing any actual gametime, while Gatland's intention to protect his Test squad was also compromised with Tuesday's draw against the Hurricanes in Wellington. "It absolutely is [a mess]," O'Driscoll told Off The Ball on Tuesday when asked if the situation with the injury replacements had become a mess. "Warren Gatland has made a mistake there, personally, because he's not staying strong with his convictions. "He talks about protecting the 23, well there's a chance that he hasn't gone and protected the 23. "Someone like Iain Henderson could easily feature this weekend, yet he hasn't been protected because he had to go and play the full 80 minutes. Granted, he did spend 10 minutes in the sin bin, but he's gone and played a full game on the Tuesday. "Say he's on the bench [for the second Test], and there's an injury in the first minute or two of the Test match, and he plays 78 minutes. That's 70 minutes on a Tuesday and then 78 minutes on a Saturday, and that's talking about protecting Test players? I don't see how that's good business at all." O'Driscoll also revealed that the six players selected have reportedly felt isolated from the rest of the playing squad and that they feel that they're being used as cannon fodder. Hill, Francis, Davies and Dacey have served as unused substitutes in both the Chiefs and the Hurricanes games, while Dell and Russell have been used as sin bin and HIA replacements respectively. The former Ireland captain sympathised with their selections but also lamented Gatland's reluctancy not to use them following the backlash surrounding their call-ups, as in his summation, it actually ended up hurting the players that they were actually meant to be providing covering for. "From what I've heard, those players that have been involved feel no part of it whatsoever," added O'Driscoll. "He's done a disservice to them too because they feel that; that they're ununsed cannon fodder. I think they're just waiting to head home. "I think they head home tomorrow [Thursday] from what I'm hearing. I don't think that worked. "You can't have a front row on for 80 minutes. When was the last time you had a front row on for 80 minutes? That's doing players a disservice, irrespective of whether they're Test players or not. Rory Best does not play 80 minutes anymore." O'Driscoll also added that he stands by his statement referring to Gatland's call-ups as the 'geography six' (given their proximity to New Zealand at the time - with Scotland touring Australia while Wales toured the Pacific Islands), and that if the Lions lose the series this whole fiasco will be used against the Lions coach. "I stand by the geography thing [geography six]. I had heard prior to the tour that this might be the case. I wasn't anticipating the quality of those players being brought in as to the standard that they were. "I wasn't even aware who Cory Hill was to be honest with you. I'm a pundit and I'm meant to know these things. "I haven't covered a whole lot of Wales in the last year. I think he's with Newport-Gwent Dragons, I don't cover them. "Guys like him, how does he feel? Is he able to go away and say that he's been a Lion? I'm sure he's probably embarrassed by it. It's a terrible situation to find yourself in as a player. "Now as a coach, the backpedaling has not served him well. This will become a big issue and a stick to beat Gats with if they lose the series 3-0. "If they lose this weekend it will be talked about all the more, if they lose the series 3-0 in particular, this will be a major contentious issue that will never be allowed happen again." Gavin Mairs Warren Gatland is to be reappointed as head coach of the British and Irish Lions for the tour of South Africa in 2021 - but the move will not rule him out of taking over the England job from Eddie Jones. Rúaidhrí O'Connor Andy Farrell has not ruled out taking a job with the Lions in 2021. Will Slattery Brian O'Driscoll can see Joe Schmidt ending his rugby retirement to coach the Lions in 2021, with the legendary centre saying the Ireland boss would be "very high on the list" of candidates.